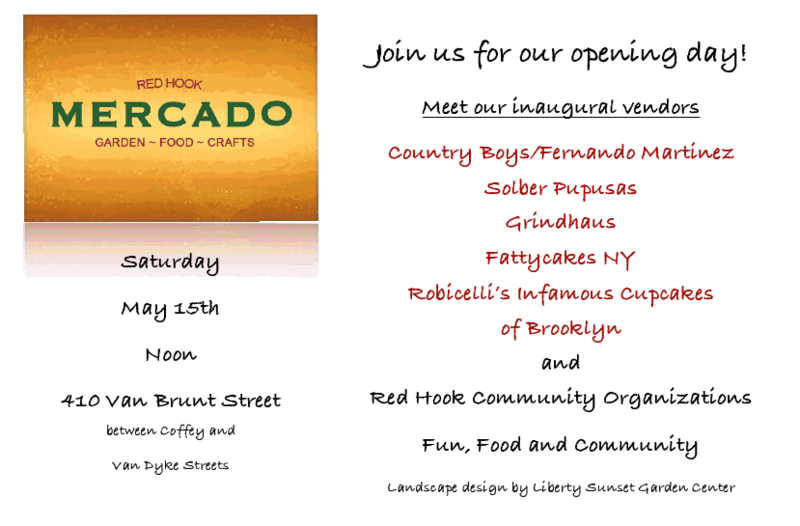 A View From The Hook: Red Hook Mercado Opens Tomorrow! Saturday, May 5th. 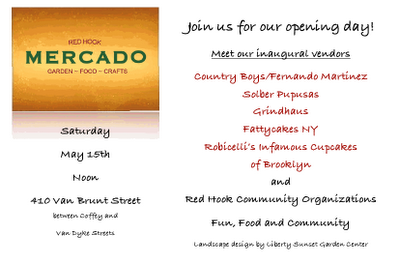 Red Hook Mercado Opens Tomorrow! Saturday, May 5th. As mentioned in the previous post, starting tomorrow you can get your non-toxic tacos, papusas and other Latin American fare from some of the excellent Red Hook Ball Field vendors, plus some German fare from the yet-to-open Van Brunt Street "Grindhaus" and baked goods from Brooklyn's "Fattycakes" and more at the "Red Hook Mercado". Kicking off at noon, at 410 Van Brunt Street, between Coffey and Van Dyke Streets.